Specializing in the leading marketing automation platforms on the market, HomeStretch Marketing has over a decade of experience working with Marketo, Salesforce and Pardot. We partner with your company to strategize, configure and optimize your CRM and marketing automation initiatives. 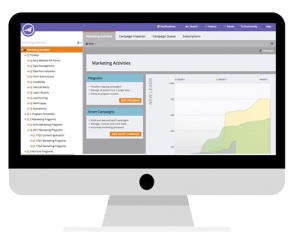 Our team works with your business to determine who your target prospects are to better score, prioritize and close more leads to make sure you’re getting the most out of Marketo. We help you gain visibility across your entire business by mapping and analyzing your current processes to better customize Salesforce to be the powerful CRM tool that meets your needs. Our marketing automation consultants implement, customize and manage your marketing campaigns in Pardot so that you see greater return on investment through lead scoring and nurturing. We strive to equip marketing and sales teams to effectively leverage technology to grow their business. We work exclusively with Salesforce, Marketo, and Pardot. With more than a decade of inbound marketing experience, HomeStretch Marketing has a proven track record of delivering results. Our strategic marketing approach is what continues to drive increased revenue for our clients nationwide.